Ex Celtic star Paddy McCourt has signed a one year deal with Glenavon. Paddy McCourt is set to make his Glenavon debut at Crystal Park tonight (Tuesday). The Lurgan Blues will take on Banbridge Town (kick-off 7.30pm) in a pre-season friendly. Admission prices are £5 adult and £3 concession. Glenavon will come up against a side who are already developing a winning habit. Town saw off a Cliftonville XI to win the Bob Larmour Cup on Saturday and then edged past Banbridge Rangers 3-2 in the Banbridge District Cup semi-final last night. McCourt, of course, signed for Glenavon last week, having moved back to Northern Ireland after leaving Luton by mutual consent. 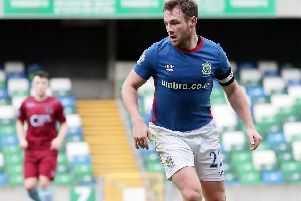 Guy Bates was also unveiled, returning to the Lurgan club after a spell at Linfield. He has already got back on the score-sheet for Gary Hamilton’s side as he netted in Glenavon 6-3 victory over Bristol City U21s last Thursday evening. “It’s massive for the club,” said a delighted Town boss Stuart King as tonight’s fixture was confirmed. It does signal a hectic week for Town who are also set to play Annagh United on Thursday and then Ballymena United on Saturday.